Chronic insomnia is defined when you have problems falling asleep, maintaining sleep, or experience nonrestorative sleep that occurs on a regular or frequent basis, often for no apparent reason. How much sleep is enough varies from person to person. Although 7 1/2 hours of sleep is about average, some people do well on four to five hours of sleep. Other people need nine to 10 hours of sleep each night. Insomnia can affect not only your energy level and mood, but also your health as well because sleep helps bolster your immune system. Fatigue, at any age, leads to diminished mental alertness and concentration. Lack of sleep caused by insomnia is linked to accidents both on the road and on the job. Insomnia is a common problem that may be temporary or chronic. As many as one in 10 Americans have chronic insomnia, and at least one in four has difficulty sleeping sometimes. But that doesn’t mean you have to just put up with sleepless nights. Some simple changes in your daily routine and habits may result in better sleep. Stress. Concerns about work, school, health or family can keep your mind too active, making you unable to relax. Excessive boredom, such as after retirement or during a long illness, may occur and also can create stress and keep you awake. Depression. You may either sleep too much or have trouble sleeping if you’re depressed. This may be due to chemical imbalances in your brain or because worries that accompany depression may keep you from relaxing enough to fall asleep. Stimulants. Prescription drugs, including some antidepressants, high blood pressure and corticosteroid medications, can interfere with sleep. Many over-the-counter (OTC) medications, including some pain medication combinations, decongestants and weight-loss products, contain caffeine and other stimulants. Antihistamines may initially make you groggy, but they can worsen urinary problems, causing you to get up more during the night. Change in your environment or work schedule. Travel or working a late or early shift can disrupt your body’s circadian rhythms, making you unable to get to sleep when you want to. The word “circadian” comes from two Latin words: “circa” for “about” and “dia” for “day.” Your circadian rhythms act as internal clocks, guiding such things as your wake-sleep cycle, metabolism and body temperature. Long-term use of sleep medications. If you need sleep medications for longer than several weeks, talk with your doctor, preferably one who specializes in sleep medicine. Medical conditions that cause pain. These include arthritis, fibromyalgia and neuropathies, among other conditions. Making sure that your medical conditions are well treated may help with your insomnia. Behavioral insomnia. This may occur when you worry excessively about not being able to sleep well and try too hard to fall asleep. Most people with this condition sleep better when they’re away from their usual sleep environment or when they don’t try to sleep, such as when they’re watching TV or reading. Eating too much too late in the evening. Having a light snack before bedtime is OK, but eating too much may cause you to feel physically uncomfortable while lying down, making it difficult to get to sleep. Many people also experience heartburn, a backflow of acid and food from the stomach to the esophagus after eating. This uncomfortable feeling may keep you awake. Doctors associate a variety of signs and symptoms with insomnia. Often, the symptoms intertwine with those of other medical or mental conditions. People with insomnia may complain of difficulty falling asleep. The problem may begin with stress. Then, as you begin to associate the bed with your inability to sleep, the problem may become chronic. 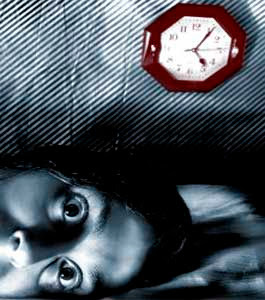 Depression and mental illnesses are often associated with insomnia. People may worsen these daytime symptoms by their own attempts to treat the symptoms. Insomnia can be a symptom of physical disorders, although for most of us it’s the result of tension, stress and anxiety-and of course the more anxious we get about our insomnia, the worse it gets. If your doctor pronounces you a “healthy” insomniac, he might suggest some of the techniques provided here. Or she might prescribe drugs to help you get to sleep. Use bath salts, or throw in Epsom salts and baking soda-one cup of each. These will relax you and also help remove toxins from your body. If you don’t like milk-or are avoiding dairy products-try a cup of hot camomile, catnip, anise or fennel tea. All contain natural ingredients which will help you sleep. Most health food stores will also have special blends of herb tea designed to soothe you and help you get to sleep.